Could analien astronomer have detected life on Earth during an ice age? Recent work hascalculated how past climate extremes affected the light reflected fromvegetation out into space. The results could give hope to our own search forlife on distant worlds. From faraway, our planet is a single faint speck of light in the sky. Although we havesent radiomessages out to potential extraterrestrial listeners, none of these signalshave traveled more than a few tens of light years. However,Earthlings have been broadcasting their presence to the galaxy for millions ofyears. Terrestrial plants reflect strongly in the infrared, resulting in adistinctive feature (called the vegetation red edge or VRE) in the light bouncingoff the Earth's surface. "Weknow from earlier works that vegetation was detectable in the contemporaryspectrum, but was vegetation visible when the Earth was much colder thantoday?" wonders Luc Arnold from the Observatory of Haute Provence inFrance. Arnold andhis colleagues have taken climate models from a recent ice age, as well as arecent warm period, and used them to generate the reflection spectrum of theEarth in times past. Their results, to be published in an upcoming issue of theInternational Journal of Astrobiology, show that the VRE has remained arelatively constantinterstellar beacon over the millennia. 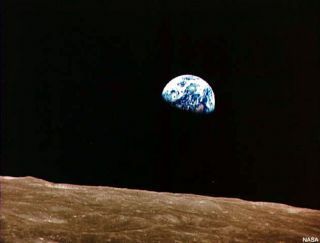 When theApollo astronauts shone their cameras on Earth, we got a first glimpse of whatour planet lookslike from space. But atfarther distances, continents and oceans blur together, and all that is left isa paleblue dot. Several spacecraft - most recently the European Space Agency'sVenus Express - have looked back at Earth from different points in the solarsystem. Theseself-portraits are not merely a case of narcissism on the part of usEarthlings. There is an important scientific question being posed: How does a planet brimming with life appear from far away? The data fromspacecraft, as well as Earthshine collected from the moon, have shown thatthere are signatures of life in the spectrum of light reflecting from Earth. Forexample, absorption lines from gases, like oxygen and methane, give some hintthat biology is at work. Even more telling is a tiny notch in the spectrum at700 nanometers, where the reflection suddenly becomes stronger towards longerwavelengths. This edge -occurring right at the boundary between visible light and the infrared - is dueto photosynthesizing plants. They absorb the visible part of the spectrum,where mostof the energy is found in sunlight. However, they reflect away the infrared- presumably to avoid overheating. Due tovegetation coverage, the Earth reflects 5 percent more infrared light than itwould if there were no plants. Arnold and his colleagues were therefore curiousif this tiny VRE signal remained observable during one of Earth's ice ages. Theyfocused on the Last Glacial Maximum (LGM), which occurred 21,000 years ago.Average temperatures were around 4 degrees Celsius lower than now, and icesheets covered all of Canada and Northern Europe. Forcomparison, they also examined a warm period 6,000 years ago, called theHolocene optimum (HO), when temperatures were roughly a half a degree Celsiushigher than now, and plant life flourished in the Sahara. "The[LGM and HO] are two extreme periods for which we have good knowledge of theclimate," Arnold says. Usingpaleoclimate models, the researchers determined the biome (e.g. tundra,tropical forest, desert) for every point on Earth during these two extremes. Each biomereflects a different spectrum of light into space. The European Space Agency'sGOME (Global Ozone Monitoring Experiment) satellite has flown over all of thesebiomes and recorded the reflection. Bycombining the biome map and satellite data with models for cloud cover and seaice, the team generated a globally-averaged spectrum for the Earth. The resultsshowed that the VRE was a little smaller (about 4 percent) during the LGM, anda bit bigger (6 percent) during the HO. "Themain point is that even in climate extremes the vegetation remained visible,"Arnold says, and this is encouraging for future space missions aimed atdetecting and characterizing extrasolar planets similar to Earth. Astrobiologistshave long pondered whether life on other planets might be detectable throughspectral signatures. The assumption has been that plant-likeorganisms on worlds that orbit a star similar to our sun will likely haveevolved a similar absorption-reflection strategy as our plants. "If wecan detect a sharp feature that cannot be attributed to a mineral or acombination of minerals, it might be a sign of life," Arnold says. The VREdetection assumes a 6-meter space telescope and 2 to 4 weeks of exposure time.No such telescope currently exists, but the TerrestrialPlanet Finder - which is still in the design stage - might be in this sizerange. "Ithink our paper shows that if continents on an Earth-like planet havevegetation, that should remain visible even during a colder than averageclimate," Arnold says.